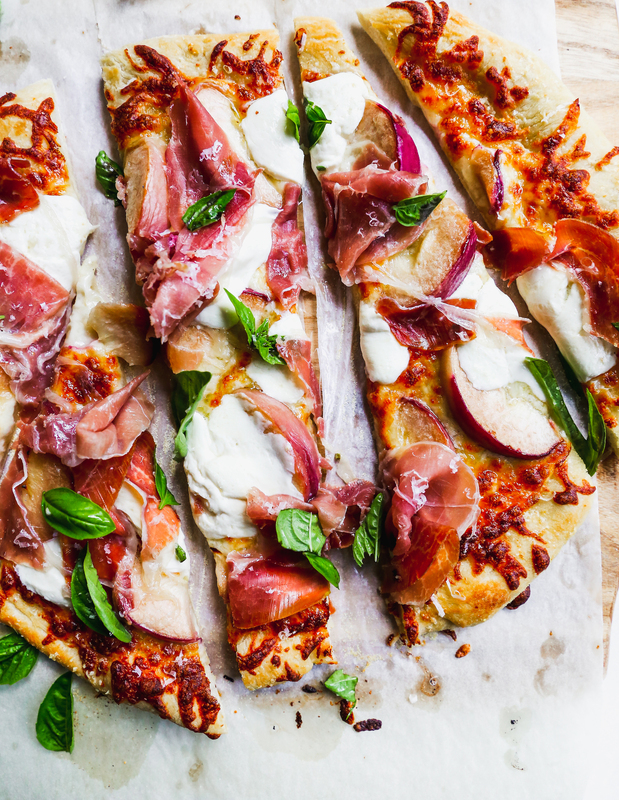 Remember last week when I told you this was the summer of pizza? We love our pizza. And this summer, for some reason, I’ve been loving making it at home more than ever. It might have something to do with the fact that Kieran LOVES watching/helping and is always eager to eat the pizza we make together. That’s a big win for me, given that my child’s diet mainly consists of boxed mac and cheese, chicken nuggets, and cereal. Seriously. Pickiest eater ever! So! I’ve been firing up the oven (yes, even in this crazy heat!) at least once a week for homemade pizza. And today’s pizza is my new favorite. Well, it’s my favorite until my next favorite. You know how it goes around here. This pizza is essentially a simple white pizza topped with juicy wedges of peach and glorious puddles of burrata cheese. 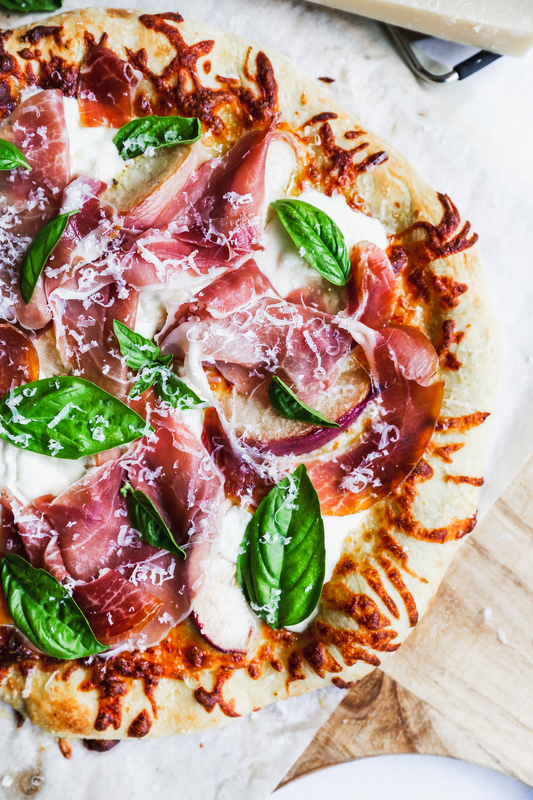 When it comes out of the oven, a layer of prosciutto goes on top. AND THEN I DIE AND GO TO HEAVEN. This combo of flavors is INSANE. The peaches right now are off-the-charts good (so sweet and succulent!) and you’ll never see me say no to burrata. The stuff is like cheese crack. If you can’t get your hands on burrata, no worries. Some good-quality fresh mozzarella will work too. You want gooey blobs of cheese, so be generous. 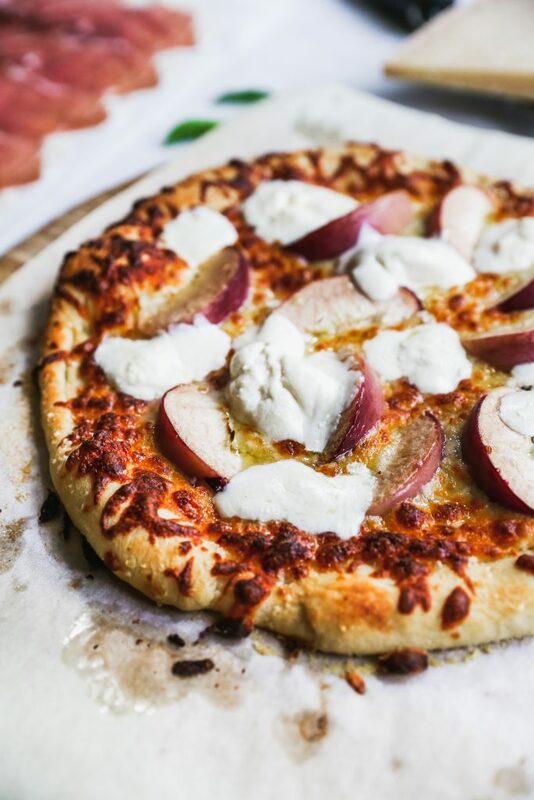 There is no better bite in the world than a mouthful of juicy peach and gooey cheese. 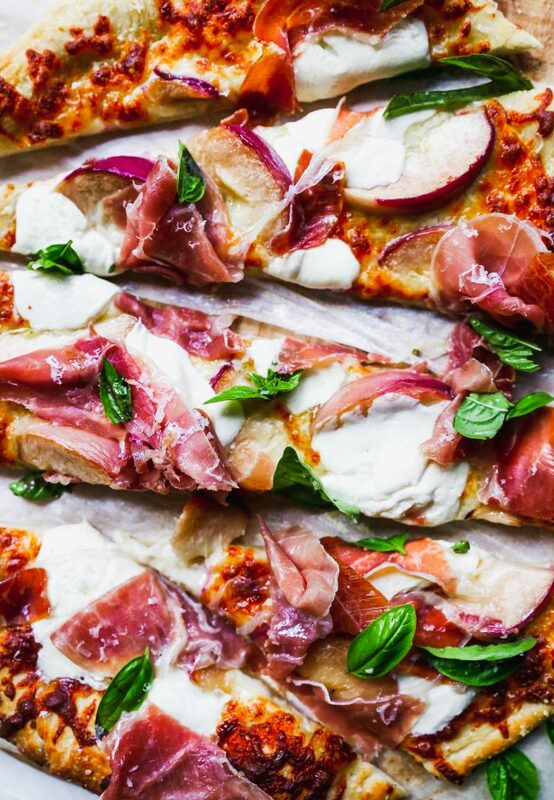 The pizza gets a simple garnish of basil and a spritz of fresh lemon juice, just to waken up all the flavors. Oh, and the prosciutto, too. I guess that’s considered a garnish? If so, let’s “garnish” all the things! This combination of flavors is so good. So, so good. 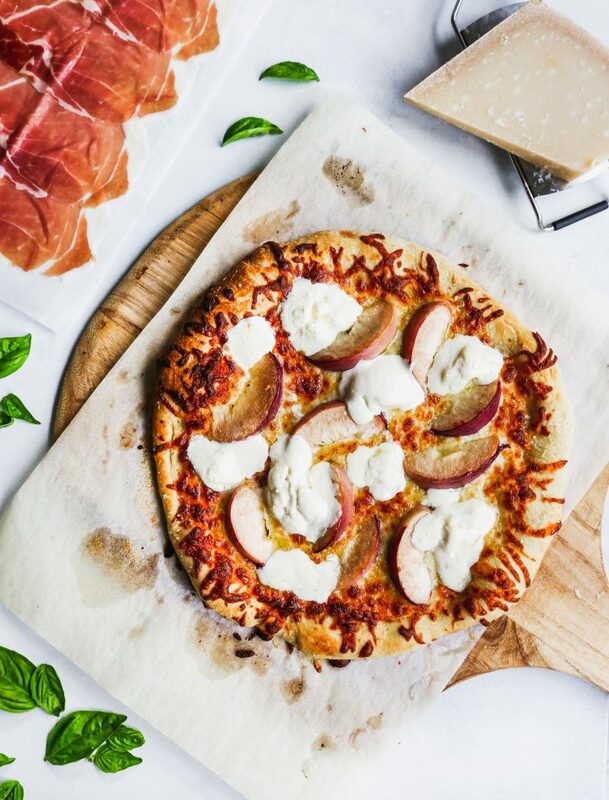 Sweet peach, gooey cheese, and salty prosciutto all accented by the summer love of fresh basil. I am one happy camper right now. Preheat the oven to 475°F and place a pizza stone (if using) on the middle rack. 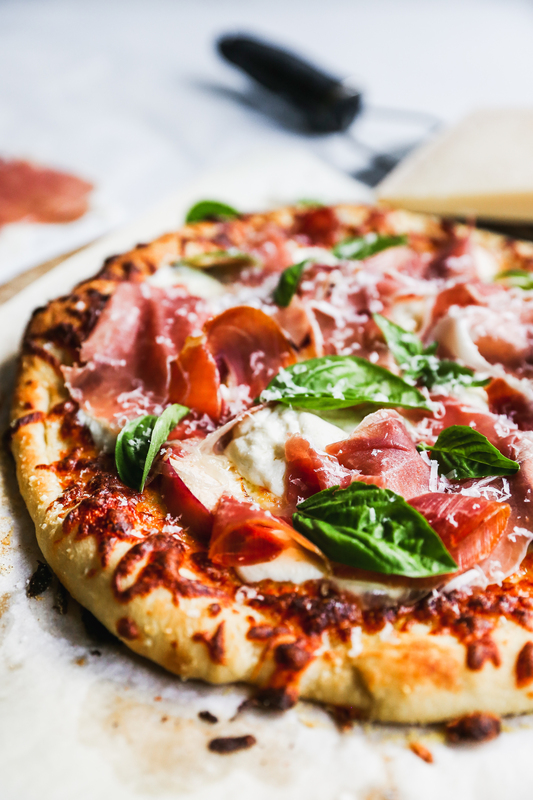 Roll the dough out to desired thickness on a lightly floured surface and transfer to a pizza peel sprinkled with cornmeal. If not using a pizza stone, liberally oil a baking sheet and place the rolled out dough on the sheet. Grate the garlic into a small bowl and add the olive oil. Stir to combine and then drizzle the garlic oil over the pizza dough evenly. 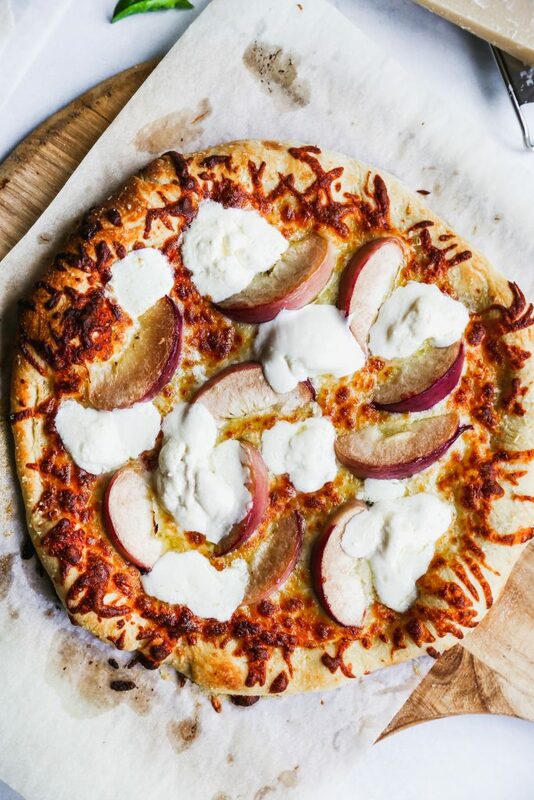 Top with the mozzarella cheese, the peach slices, and sprinkle of salt and pepper. Gently tear the burrata into pieces (this will be messy) and distribute them as evenly as possible. 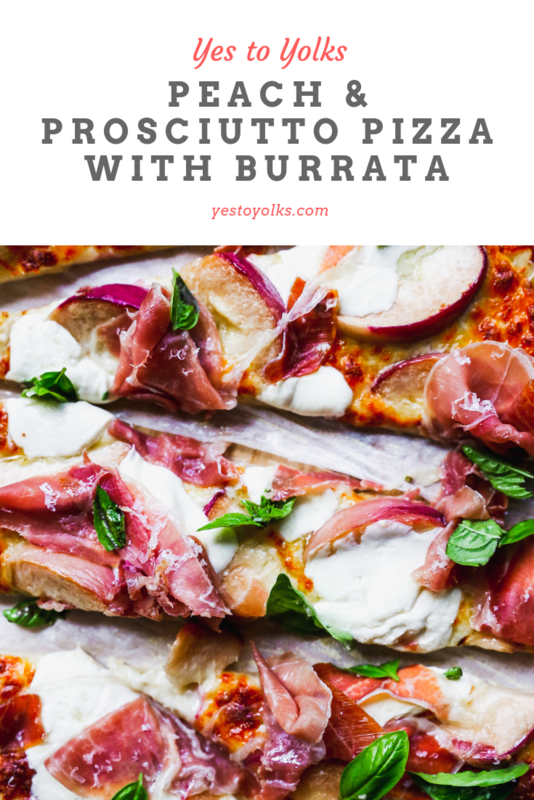 Bake for 10-12 minutes, or until the pizza dough is crispy and golden and the cheese is bubbly and browning in spots. 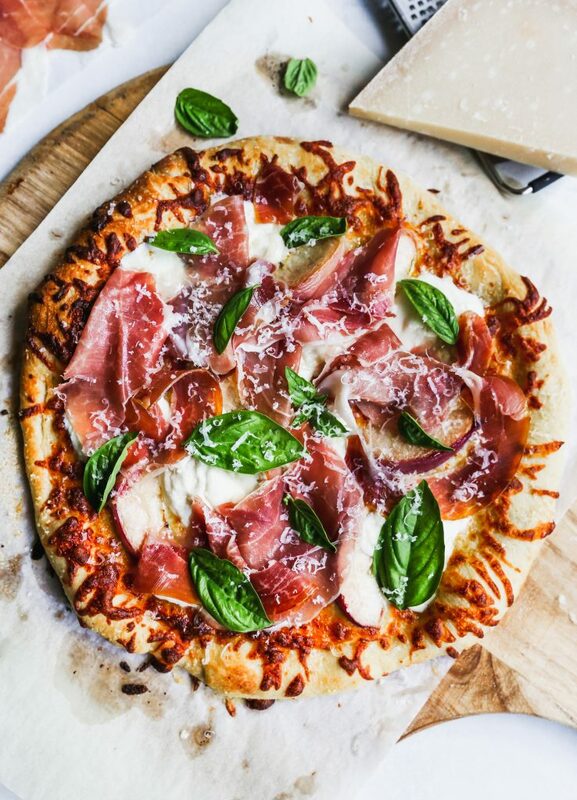 When the pizza comes out of the oven, top with the slices of prosciutto. Garnish with fresh basil and a spritz of fresh lemon juice. Slice and serve while warm.